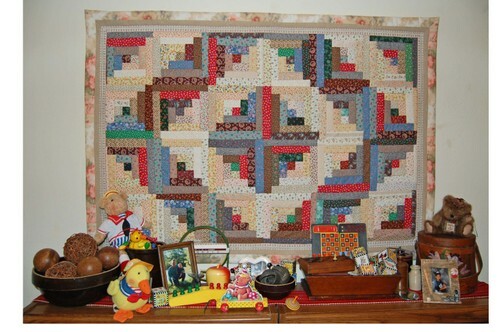 I love the log cabin quilting method as the whole thing (including piecing, incorporating the batting, and quilting) can be done by machine in one step. This quilt hangs in my home office. Try squinting for a different effect. By the way, you can see part of my toy collection on top of the bookcase under the hanging. I love antique, vintage, and reproduction old-fashioned toys and collect those along with children's books.